When I learned that Pierre Auguste Renoir had arthritic hands like mine, I thought, "If he could paint maybe I could too". In 1996, I began turning my dream of painting into reality. I find that when I paint I am in another dimension. My world has become an explosion of color and interesting shapes found in flowers, buildings, and landscapes. I endeavor to paint the excitement I feel by allowing vibrant pigments to mix on the paper. 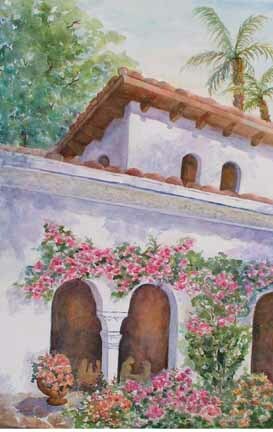 In August 2004, my “Casa Del Sol” painting appeared on the cover of the East Side Adult Education Schedule of Classes. In 2003, I was awarded "Artist of the Year 2002" by East Valley Artists. 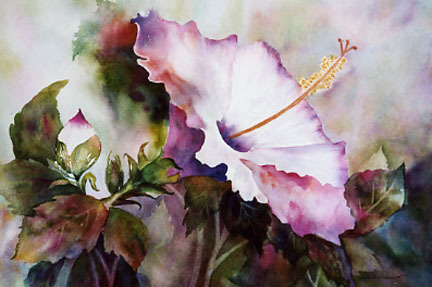 In May 2002, my Pink Lemonade Hibiscus was awarded First Place in EVA's juried Annual Show.